WHEN plants are genetically modified, there is nothing to ensure that pollen from them would not be carried to their wild kin by pollinators. How the gene, originally introduced into the cultivated plants, settles down in an environment not meant for it requires observation. The gene’s presence in the cultivated plant, too, makes it susceptible to unexpected trouble. Farmers growing cucumber (Cucurbita pepo) were unhappy with the viral diseases that the plant is suceptible to. Hence it was genetically modifed for resistance. But this virus-resistant gene (VRT) did not restrict itself to the cultivated plants. Entering the wild Texana gourd species—weeds in soybean and cotton fields—it increased their weedines. And that was not all. The gene also managed to invite non-viral predators to the cultivated plants. Researchers led by biologist Miruna A Sasu from the Pennsylvania State University in USA studied the virusresistant gene (VRT) in the Texana wild squash species (Cucurbita pepo texana) and compared results with that of wild plants which did not have the gene. Both the types were grown together in experimental fields and studied for three years. The plants without the gene were soon afflicted by viral diseases. Since the VRT plants were free of such diseases, they attracted more pollinators, produced more pollen and seeds. This is bad news for soybean and cotton farmers who have to deal with sturdier weeds now. “Transgenic cultivated plants and wild squash grow in close proximity in southwestern US and Mexico. 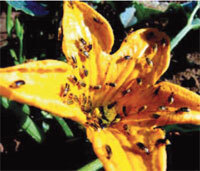 The pollen from the transgenic plants produce seed in the wild squash populations and make them resistant to viral diseases that keep their populations under control,” explained Andrew G Stephenson, professor of biology at Pennsylvania State University and a study member. As the experiment progressed, the team saw that the herbivorous insects, too, flocked over to the VRT plants since they sported healthy foliage. There was an increased presence of the cucumber beetles. Soon the wilt disease bacteria joined the swarm. This undid the gene’s work and reduced the reproductive output. The genetically modified variety had come as a relief to farmers. But the bacterial wilt disease spreads fast and is fatal too. The study reported in the October edition of Proceedings of the National Academy of Sciences, shows the perils of genetic modification. While the future of a GM plant is uncertain, its genes lead to problems elsewhere.